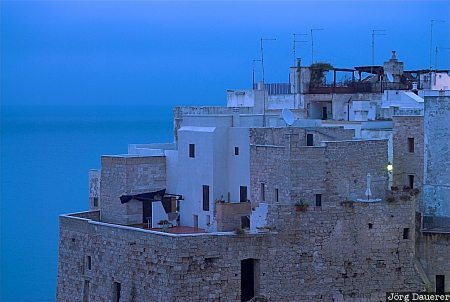 Houses of Polignano a Mare and the Mediterranean Sea in the background before sunrise. The coastal town of Polignano a Mare is in Apulia (Puglia) in the province of Bari in southern Italy. This photo was taken in the early morning of a rainy day in late April of 2006. This photo was taken with a digital camera.